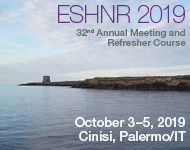 ESHNR.eu | . : ESHNR News :. We hope to welcome you to the 32nd Annual Meeting and Refresher Course of the European Society of Head and Neck Radiology. The event will be held in Cinisi, a wonderful town in the province of Palermo in Sicily. We have an exciting scientific program planned, comprising updates on the latest fields in head and neck imaging, interactive lectures and refresher courses.